Enter for a chance to win a set of TaylorMade Golf Clubs! 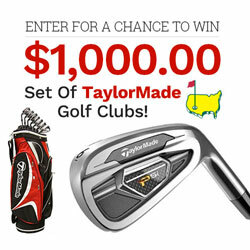 Every month one lucky winner will score a $1000 Gift Card to purchase a new set of TaylorMade Golf Clubs. Enter daily for your chance to win! The prize for each Monthly Promotion Period is $1,000 cash, or a $1,000 gift card, or other cash equivalent with a value of $1,000 (each a “Monthly Prize”). HINT: You can actually get up to SIX entries each day. See the rules for details.